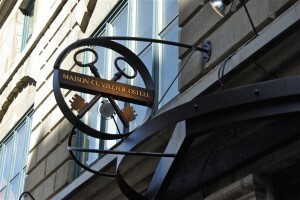 The Jewish community has been an integral part of Quebec society for two and a half centuries but few people are aware of it, according to Dr. Victor Goldbloom in a letter to the editor in The Gazette of April 10, 2009. The Mechanics’ Institute of Montreal (now the Atwater Library and Computer Centre) doesn’t go back that far, but an examination of its records going back to 1828 reveals that the closely-knit Jewish community, then numbering about 100, began participating in Institute activities more than 180 years ago. According to one source, Aaron Hart was the owner of the first winner of the King’s Plate in Trois-Rivières in 1836 (foreunner of the Queen’s Plate in Toronto). Joseph family. Samuel Joseph was a young man of 26 when he joined MMI. He was based primarily in Berthier-en-haut (now Berthierville) where he was running family enterprises, and his father Henry Joseph had extensive businesses in Montreal. Having become an MMI member on July 7, 1829, Samuel Joseph chaired a meeting on July 21, and the following year he donated to the MMI museum an Indian carved pipe in the form of a monkey—at which time his address was listed as St. Jacques. Tragedy struck in 1832, when Samuel was stricken with cholera in Berthier. His father rushed home to be by his side, but was too late; Samuel died on June 15. His father too was stricken with the disease and died on June 18, 1832. About 1840, another of Henry Joseph’s sons, Jesse Joseph, commissioned Mechanics’ Institute member architect James Springle to build a series of warehouses at 386 Lemoyne, one of which has recently been declared a National Historic Initiative site, and the building will be turned into luxury condominiums. Get in touch with the Montreal History Website here. Samuel Joseph’s sister married Rev. Abraham de Sola in 1852. His brother Jacob Henry Joseph became a life member of MIM in 1867. Hays family (Hayes). Moses Judah Hays was a man of extraordinary energy and enterprise, had a sense of civic duty, and he had rotten luck. Born in Montreal in 1789 into the successful Andrew Hays family, he entered the Royal Engineers in 1814, but soon resigned to become involved in family enterprises. He joined the fledgling Montreal Mechanics’ Institution in 1829 where he played a small but continuing role. When it was organized as the Mechanics’ Institute of Montreal in 1840, he acted as auditor for the election of the new officers, and soon afterwards became a life member. In the MIM guestbook, his name is listed as host in 1854 for Mr. G. Thompson of New York. A cousin in Philadelphia, the renowned ophthalmologist and editor Dr. Isaac Hays, was a founder and long-time secretary of the Franklin Institute, which had similar aims to those of the mechanics institutes. Dr. Hays was proposed as an MMI corresponding member in September 1829 by Aaron Philip Hart and ordnance officer William Holwell. On November 26, 1829, Dr. Hays donated a copy of the “Constitution and Laws of the Montreal Mechanics Institute” to the Franklin Institute. There was continuing communication between the two organizations. In the mid-1830s, Moses Hays was made a judge of the Court of Special Sessions, a position he held until 1840. He helped to establish the Hebrew Philanthropic Society in 1847 to assist Jewish immigrants arriving from Germany. He held the office of sword bearer in the Masonic Provincial Grand Lodge. The owner of a farm in what is now Westmount, he was president of the County of Montreal Agricultural Society 1846-51. On part of that property, he built Metcalfe Terrace: a group of four houses, of which two still exist, Nos. 168 and 178 on Cote St. Antoine Road; according to Aline Gubbay, they were originally built to house part of the Governor-General’s staff–his residence being Monklands, now the Villa Maria school. In 1845, the Corporation of the City of Montreal bought Moses Hays’ Montreal Water Works. Two years later, in the major project of his life, he built the Hays Block in tony Dalhousie Square. It housed a shopping area, a fashionable hotel and a comfortable theatre that could seat 1,500. In 1852, the result of a hot spell and poor municipal planning, a terrible fire broke out, which destroyed 1,100 homes in Montreal, along with the Hays Block. Moses Hays was financially ruined. But later that year, he was appointed Montreal’s Chief of Police, a position he held until his death in 1861. Solomons Family. Lucius L. Solomons, son of a prominent furtrader, was proposed as a member of Montreal Mechanics’ Institution in 1829 by Samuel Joseph and turner James Poet. In September 1829, he donated a “box containing several specimens of mineralogy, also an analysis of the Saratoga Water.” Solomon Solomons became an MIM member in December 1840; perhaps he was a relative of Lucius Solomons. Samuel(s) Family. Little of the Samuels family is revealed through the MIM minutes. These men may have been related: Arthur Samuels and Steven Samuels joined MIM in 1841. Mark Samuel became a first class member in 1855 (the same year as Alexander Levy). Henry Samuel became a 3rd class member (apprentice furrier) in September 1869; J. Samuel became a 2nd class member [journeyman] on April 11, 1870. Levy Family. Baltimore, Maryland resident James Levy was elected a corresponding member in August 1930. In 1855, Alexander Levy became a first class member of MIM, followed by Henry Levy in 1859 as a 3rd class (apprentice) member. De Sola Family. The Rev. Abraham de Sola arrived in Montreal from England in 1847, at the age of 21, to take up duties as rabbi for the Corporation of Portuguese Jews of Montreal. He was to hold this position for 36 years. Born into a prominent London rabbinical family with roots in Spain and Portugal, Abraham de Sola early on gained international recognition for his writings on Eastern languages and literature, and on Jewish history and scripture. The year after his arrival in Montreal, he was appointed lecturer in Hebrew & Oriental languages at McGill, and in 1853 was made professor. An active member of English Montreal’s intellectual community, he gave talks at many organizations, including the Mercantile Library and the Numismatic & Antiquarian Society. He collaborated with Sir William Logan and Sir William Dawson in the work of the Natural History Society. He spoke several times at the Mechanics’ Institute, including in 1851 on “The Ancient Hebrews as Promoters of the Arts and Sciences,” and in 1856 on “The Arts and Sciences among the Ancient Jews.” He was awarded a life member of MIM. In 1872, at the age of 46, he was asked by the U.S. government to deliver the opening prayer for that year’s session of the U. S. Congress, the first non-US citizen and the first non-Christian to perform that ceremony. 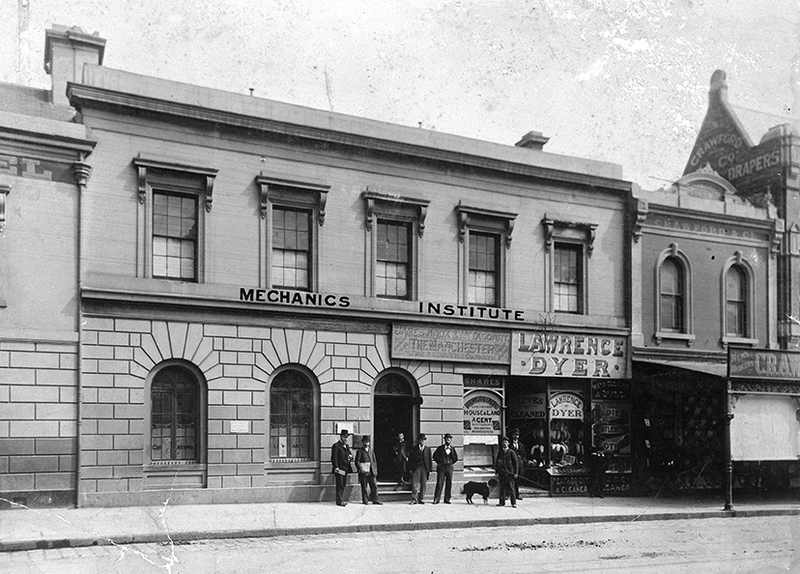 Two of his sons, Meldola and Clarence, became members of the Mechanics’ Institute. Meldola de Sola, who later succeeded his father as rabbi, joined MIM in September 1872, and among those signed in as his guests in the 1870s and 1880s were E. P. Cohen of Philadelphia, S. Belain and James Davies of New York, and the Rev. H. P. Mendes. Clarence de Sola became a successful Montreal businessman active in large construction projects, and served as Belgian consul in Montreal beginning in 1905. In 1880, along with Maxwell Goldstein (later the first president of the Federation of Jewish Philanthropies), Clarence de Sola, then 22 years old, was active in MIM’s Literary and Debating group. The MIM guest book lists Percy David as his guest on December 28, 1890. His substantial home, at 1380 Pine Avenue, still exists. Women pupils. The first female pupil recorded in the MIM minutes was Isabella Sternberg. She joined MIM in 1869 as a third class (pupil) member, and it is likely that she was registered in one of the architectural, mechanical and ornamental drawing classes then offered at the Institute. She was followed in 1870 by MissCarry Lazarus, Miss Himes, Miss K. Franklin and Miss P. Teichman (all 3rd class members—i.e, under 21 or apprentice/pupil). Gubbay, Aline, Monteal, the Mountain and the River. Trillium Books, 1981. The construction for the Mechanics’ Institute of Montreal was finished in 1920. 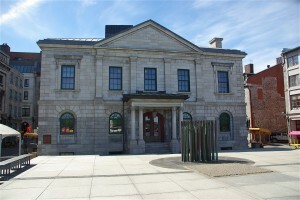 This elegant building houses the oldest subscription library in Canada. After it was established in 1828 the Institute provided the working population with technical knowledge and training. Embodying the mission and ideals of the organization, the building interior is decorated with sculpted medallions representative of the mechanical arts, as well as marble and oak. The exhibit rooms, lecture hall, classrooms, and reading rooms continue to serve their initial purpose, and The Atwater Library remains to be the last working Mechanics’ Institute building in Canada. 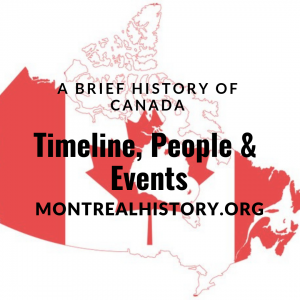 If you want to learn more on important people and events in Canadian history, as well as Montreal Canadian History, stick around and navigate through Montreal History Website. Welcome to montrealhistory.org, a place where you can explore Major Events In Canadian History, as well as prominent and Important People and Events in the country’s history. Moreover, we collect writings, photos, and information about the history of Montreal and it’s people. Be sure to check out our selection of Books On Canadian History, as well as our recommendations.